Item2011.3.3.97 - C.G. elevator, Prince Rupert, BC. Item2011.3.3.98 - Rail cars in Prince Rupert, BC. Item2011.3.3.99 - Fishing boats in Prince Rupert, BC. 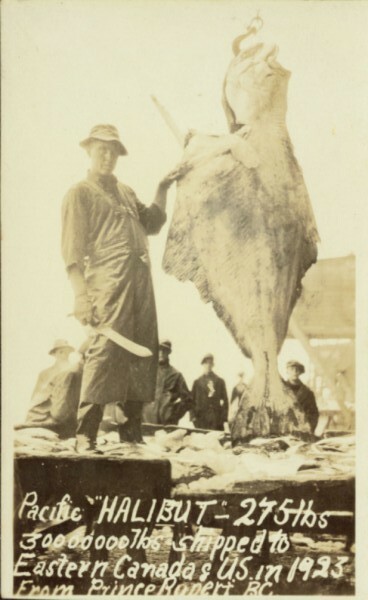 Photograph of a fisherman brandishing a large knife next to a halibut on a hook. Printed annotation on recto reads: "Pacific 'HALIBUT'- 275lbs 30000000lbs shipped to Eastern Canada & US in 1923 from Prince Rupert BC." Item is part of the North Coast & Central BC Postcard Collection.